A near-record crowd of 7,862 runners and walkers from 280 companies gathered at Onondaga Lake Park for the 34th running of the J.P. Morgan Corporate Challenge on Tuesday, June 7. It was the fourth largest crowd in this event’s history (the record was 8,564 in 2014). 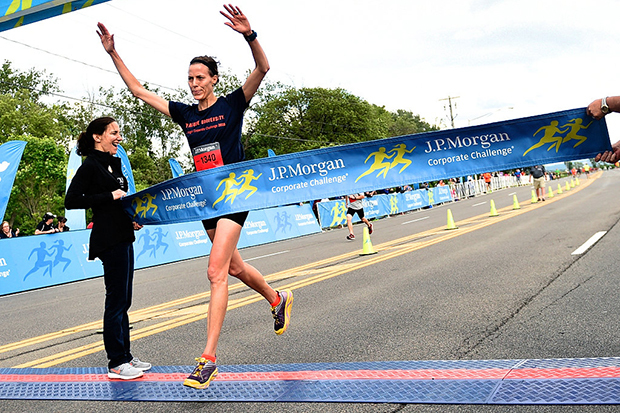 It was a return to the winner’s circle for Syracuse University’s Sascha Scott, associate professor of art and music histories in the College of Arts and Sciences, who came across in 21:20 to log the fastest time for the women. The 2014 champ finished about a half-minute in front of Jordyn Naylon (21:53) from People Systems. Tina Hunt of Health Fitness took third in 22:01. Lee Berube of Upstate Medical University found the conditions (62 degrees, 21 miles per hour wind at race start) to his liking, racing home in 17:36 over the 3.5-mile course to set the fastest time for the men. Wegmans had the largest number of entrants in the event, 418. Its grocery rival, Tops Markets, was second with 306. Syracuse University (179), Crouse Health (176) and National Grid (168) rounded out the top five. The JPMorgan Chase Foundation will make a donation on behalf of all participants to Vera House, a first-time beneficiary partner with the Corporate Challenge. Vera House works to end domestic and sexual violence and elder abuse. Its services include counseling, advocacy, emergency shelter and education. The organization was represented on site by Executive Director Randi Bregman and Board President Mark Fuller. 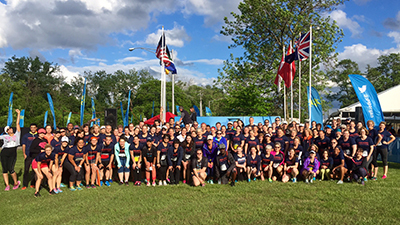 The Syracuse event was the sixth event of the 2016 J.P. Morgan Corporate Challenge Series, celebrating its 40th consecutive year of operation.